Home again and — zzzzz …. I’m back. It’s lovely to be home. Now all I need to do is conquer the jetlag, which is of course compounded by retroactive knackerdom due to the high level energy output of the trip! And of course the various germs accumulated on the trip home, since an airplane is nothing more than a self-contained petri dish of ick. In other words … sleeeeep! Sleeeeep! And many many herbal drugs. Going by past experience, I should be back to relative normal by Monday. I have resizing and sorting of photos to do, and then there’ll be a series of photo essays on the trip. Work on Tarnished Crown bk 2 will resume on Monday too, with much excitement. Reviews are coming in for The Falcon Throne and I’m both thrilled and relieved to report they’re largely positive. Phew! Will share some asap. Now I must hie myself off to the chiropractor because naturally my back is playing up now. And so my amazing European globetrotting adventure gently draws to a close. I fly home tomorrow night, rested and rejuvenated and ready to leap back into work. Everything I’ve seen and done while I’ve been travelling truly has nourished the storyteller in me. Many many notes have been jotted down, often in the middle of a meal! And scenes continue to take shape and come alive in my imagination. It’s very exciting and I’m so looking forward to diving back into the next book once I’m home again. I’ll also be posting a series of photo essays on things I’ve seen and what they mean to me, as a writer. I’m really looking forward to that, too. What won’t I miss? Well, let’s put it this way. What do London – and England in general – have that Sydney doesn’t? More fabulous theatre than you can poke a stick at? Yes, but that’s not it. A stupendously effective public transport system? Yes, but that’s not it either. Easy and financially manageable access to the wonders of Europe? Yes, but no, no, that’s still not it. More history, culture and exciting adventures to be had on a daily basis than anyone could think possible? Yes, they certainly do, but still that’s not it. Give up? Well, I’ll tell you. It’s stairs! Stairs! Oh my giddy aunt, there are so many STAIRS. I’ve been here almost a month and I swear on my great aunt’s grave I now have buns of steel. Or at least bronze. Or they would be bronze if I ever did any sunbathing. Bottom line (ha ha, that was a pun, did you notice?) you cannot escape stairs in England. In the museums, in the hotels, in the tube stations! Oy vey, the tube stations! I’d forgotten the stairs in the tube stations. I’d forgotten the stairs full stop. The only good thing is that this month away has handily laid the foundations for the new get fit regime I’ll be starting when I get home. Stay tuned for that! I have walked many many kilometres on this trip and I have climbed more stairs than any human being should have to. Which is good because I need to get back into shape again, pronto. But if you’re coming over for a visit? Just remember what I say. Beware the stairs! And make sure you have good trainers for the climbing. Between the parishes of Shetfold and Marslake in Somerset existed an area of no man’s land and a lot of ill feeling. Boom! Sold. The book is The Assassin’s Prayer, by Ariana Franklin. 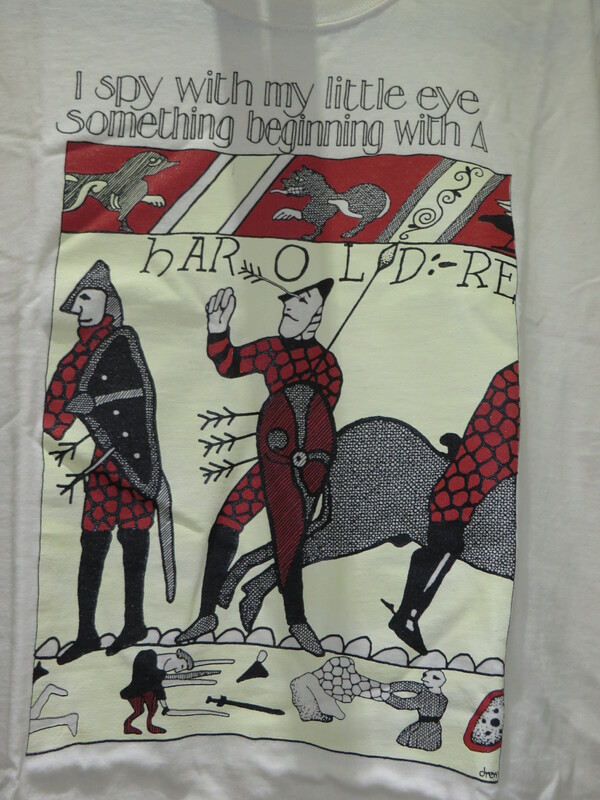 It’s historical mystery, set in the time of Henry II. As it happens, this is the fourth book in the series. As a rule I don’t like reading series out of order but I was enchanted by that first line and needing something new, so I bought it. I’m so glad I did. I now have the first three books as well, and am halfway through book one, Mistress of the Art of Death. The series’ protagonist is one Adelia Aguilar, a woman doctor trained in the enlightened medical school of Salerno. Think of her as the medieval world’s answer to Kay Scarpetta. Adelia solves murders forensically while fighting the extreme misogyny and superstition of the medieval church. She’s a wonderful hero: brave and ethical and witty and stubborn. If you like murder mysteries, especially the historical kind, I can’t recommend these books highly enough. The research is impeccable and seamlessly woven into the narrative. It’s world-building of the highest order – aspiring novelists take note! So there you have it. Two thumbs up for this amazing crime series. Go forth and read! And let me know what you think. Well, with much excitement and some trepidation (because there’s always a smidgin of trepidation, you know) I can shout from the roof tops that today is the official UK and US release day of The Falcon Throne. Many many people are owed thanks for the publication of this book. They’re all mentioned in the acknowledgements, but let me thank again in particular: my lovely agent Ethan Ellenberg; my wonderful publisher, Orbit, and Tim Holman; my superhumanly patient and supportive editor Anna Gregson; the entire Orbit production and sales/marketing team; Anne Clarke in the Orbit US office and her team; the exquisitely persnickety Abigail Nathan of Bothersome Words, copy editor par excellence; my delightfully honest beta readers Mary, Elaine, Pete, Glenda and Mark; and most of all the readers who make it all possible. If you buy the book, thank you. If you like it, I’d truly appreciate knowing that. And if you do, if you could spread the word, that would also be hugely appreciated too. These are strange days for writers and publishers. Word of mouth can do so much to keep our quirky business alive. A SPECIAL REMINDER FOR USA READERS: since the conflict between my publisher and Amazon US remains unresolved, and all Orbit authors are being penalised as a result, no good will come of you ordering The Falcon Throne through Amazon.com. Please avail yourself of the many other options as outlined on the Where to Buy page of this blog. That’s a huge honour. Thank you, Io9! You can check out the full list of recommended books here. Also, a reminder for you to enter the giveaway comp for The Falcon Throne. Deadline is September 1st and I’ll be announcing the winners asap after that date. I’ll be in London and based at a hotel, so it shouldn’t be too long a wait! So, one of the reasons I wanted to research in France was so I could visit the amazing Guedelon — where they’re building a medieval castle from scratch, using only medieval tools, techniques and materials. The project started in 1998 and they anticipate the castle being finished in 2023. I’d love to come back for that. It’s an amazing experience and I look forward to putting up some photos when I get home. Mind you, it’s not the most straightforward place to get to! We hired a car in Nevers and drove there. Cue the white knuckles — they drive on the wrong *g* side of the road in France and the sat nav was in French to boot and neither of us is fluent! But we made it. On the way back we detoured via St-Fargeau to see the amazing castle in that small town. The castle has a 1000 year history, but had been let deteriorate. Not all of it is open, but what we did see was amazing in a bizarre kind of way … plus there was something truly ick, but I’m not saying what because it is so going to feature in Tarnished Crown book 2! In due course I will post photos, when it comes time to talk about the book. Less icky was the truly stupendous tartlette citron we enjoyed after our hours of tramping through the woods and half built castle, and then the chateau. Tomorrow we sally forth to Angers, where there is another astonishing castle to explore. And then we head back to the UK, and part ways. But I catch up with Glenda Larke again then – so stay tuned for more whacky research adventures! It’s Book Day in Australia and New Zealand! The Falcon Throne is now available for purchase in Australia and New Zealand! It’s very exciting, also terrifying, and I’d like to say thank you in advance to everyone who’s looking to buy a copy in either trade paperback or as an ebook. I just really really hope you enjoy it! For more information, Australia and New Zealand readers, go here. First of all, it’s publication day in Australia/New Zealand! The Falcon Throne is officially let loose into the wild. If you do buy a copy, Oz and Kiwi readers, I hope I haven’t disappointed you! In other news, Sharon and I had a wonderful morning stroll along the Rue de Rivoli then along the Champs d’Elysee, all the way up to the L’Arc de Triomphe. We may have perpetrated French pastry and bread along the way. Yes, all right, we did. I indulged in a small pistorale avec olives (yum!!! French bread! Yum!! It doesn’t make me unwell the way bread at home does. A good thing then that I don’t live here, or I’d end up looking like a baguette.) I also bought a beignet chocolate, petit, and a tartlet citron. The tartlet I will share with Sharon for dessert after our final dinner in Paris at Chez Claude’s. Then we strolled back (in the rain, sigh) and enjoyed the wonderful artefacts in the Musee des Artes Decoratifs. Some truly beautiful pieces and many many stairs, which made up for the beignet and the bread. Now I’m about to download all my photos, then relax until dejeuner. Tomorrow we bid adieu a Paris, and frolic our way to Nevers. Stay tuned! And in closing, here’s a link to the Oz/NZ edition of The Falcon Throne, now available in trade paperback and ebook. More information about it here, at this link. If I had to pick one reason to love Paris, it would have to be the gargoyles. I don’t know why I love them so much. I just do. If it’s not the ones right outside my hotel window (courtesy of St Germain church) then it’s the ones that populate the exterior of Notre Dame. I got some wonderful photos of them today with my handy dandy emergency purchase camera (it’s brilliant, I’ll talk more about it later) and will post a gargoyle photo essay upon my return to Oz. A couple of days in Paris just isn’t enough. There is so much to see and explore. But I had to choose between all Paris or chateaux in the countryside, so of course the chateaux won. But next time … more Paris! The writing continues. Oddly enough, the weird sleep cycle helps. If I’m awake at 3 am, what else is there to do??? I’m already having lots of fun with it. Plus it helps take my mind off the fact that The Falcon Throne is released very soon now. Arrgghhhh! My knees, my knees, they are knocking! Also? Apparently the French govt just fell over. I swear, it wasn’t me. How wonderful. I’m in Paris! And there are gargoyles almost close enough to touch right outside the hotel window. Around the corner there’s the Louvre. C’est magnifique! After Paris it’s Nevers, and then Angers. All too exciting for words. Can’t post photos while I’m travelling, but be warned — there will be many once I’m home again! 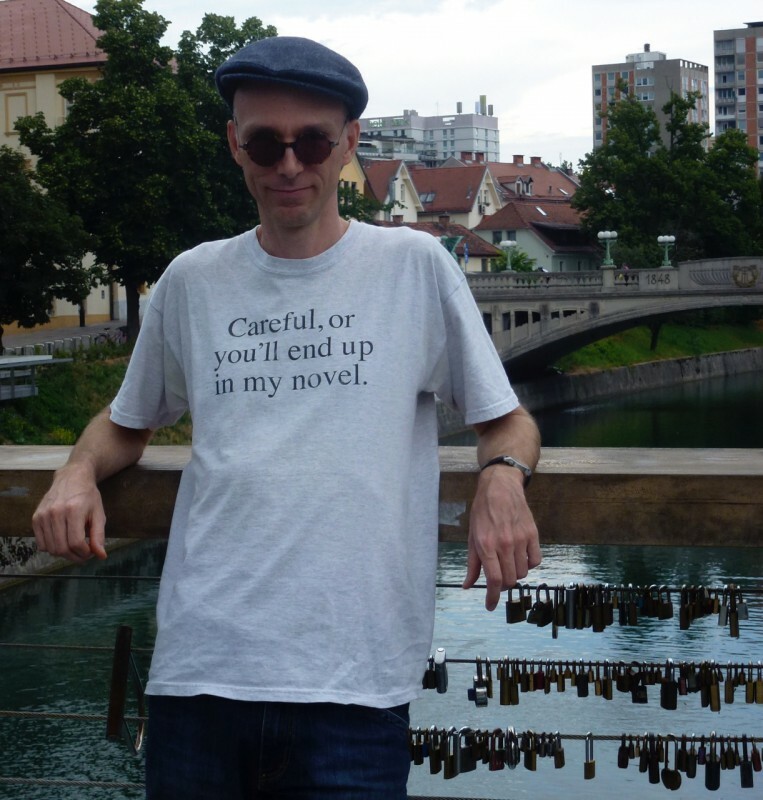 Welcome to the Talkative Writer’s guest post with British speculative fiction writer Angus Watson. In his twenties, Angus Watson’s jobs ranged from forklift truck driver to investment banker. He spent his thirties on various assignments as a freelance writer, including looking for Bigfoot in the USA for the Telegraph, diving on the scuppered German fleet at Scapa Flow for the Financial Times, and swimming with sea lions off the Galapagos Islands for the Times. Now entering his forties, Angus lives in London with his wife Nicola and baby son Charlie. As a fan of both historical fiction and epic fantasy, he came up with the idea of writing a fantasy set in the Iron Age when exploring British hillforts for the Telegraph, and developed the story while walking Britain’s ancient paths for further articles. 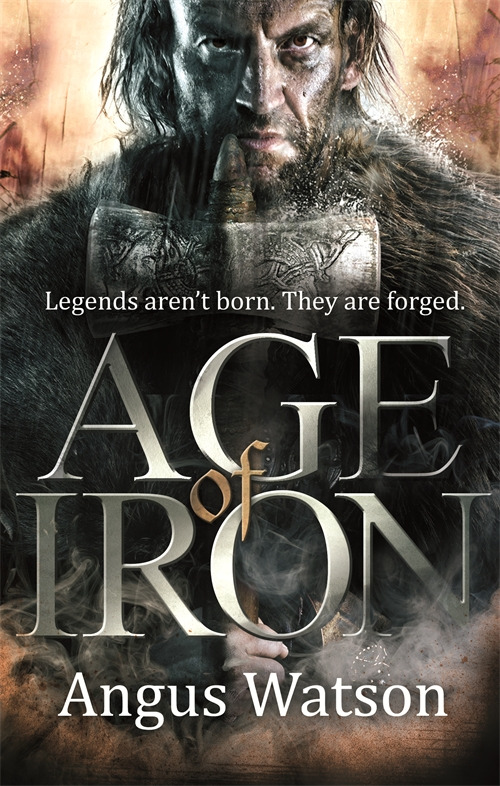 Age of Iron, the first book of his Iron Age trilogy, will be published on September 2nd. You can find out more at his website. I’m going through the copy edit of Clash of Iron – book two of the Iron Age trilogy – at the moment. 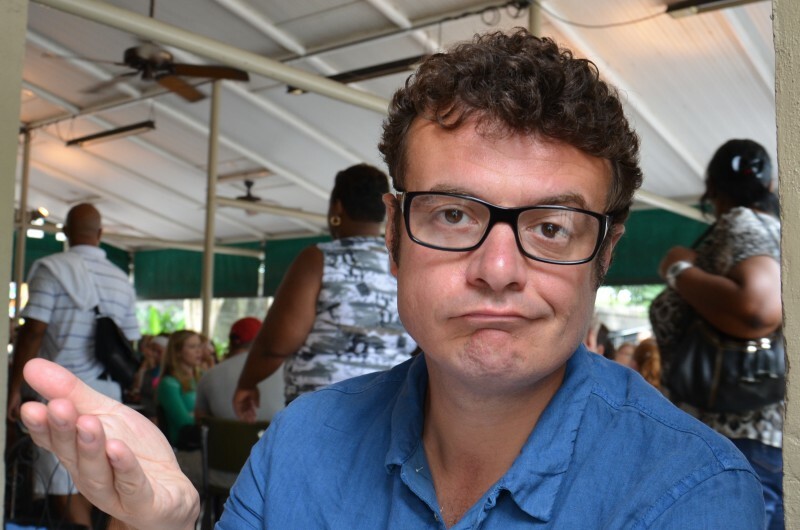 The copy edit is the second last edit before publication, when an expert reads your book and says ‘this bit doesn’t work, that word’s wrong’ and so on, then you get to go through what they’ve said and lament how they just don’t understand you and change it all back…. Not really, my current copy editor, a man named Richard Collins, is excellent (the final edit is the proof edit – basically a spell check). Welcome to the Talkative Writer’s guest post with Australian speculative fiction writer Donna Maree Hanson. 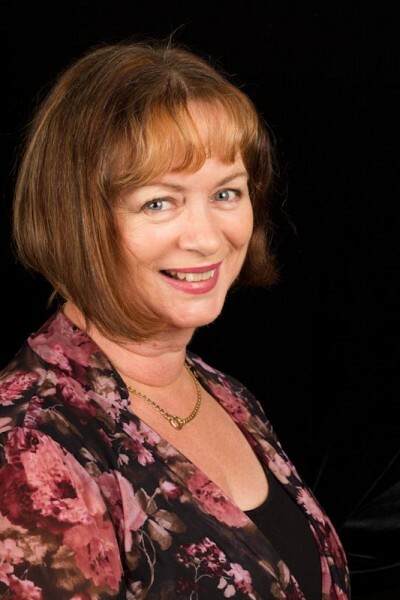 Donna Maree Hanson is a Canberra-based writer of fantasy, science fiction, horror and, under a pseudonym, paranormal romance. She has been writing creatively since November 2000. In January 2013, her first longer work, Rayessa & the Space Pirates, was published with Harlequin’ s digital imprint. This novella length work is a young-adult, science-fiction adventure/romance (space opera). A sequel to Rayessa & the Space Pirates will be out with Escape in early 2015. Dragon Wine is to be published by Momentum (Pan Macmillan Australia’s Digital Imprint) in two parts, Shatterwing and Skywatcher, in September and October 2014. She can be found at her blog here. I can’t believe it took ten years.